Here's 17 great quotes about music you don't want to miss, plus a few great tunes at the end to hopefully inspire you. All opinions and recommendations welcome! and charm and gaiety to life and to everything." the heart of nature being everywhere music." to reach the soul for the education of its virtue." "Life dies but forever will there be music. Always." but which mankind cannot comprehend." and delightful presents God has given us." 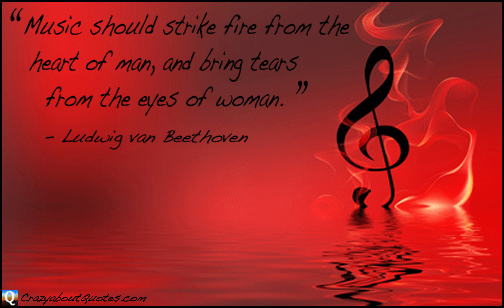 and bring tears from the eyes of woman." ...oooor not depending on your taste! Anyway I hope you enjoyed these music quotes folks. Here's a few tunes from some legends in the music industry that have been consistently inspiring us down the years. I'd love to know what songs inspire you? Leave your favourites in the comment box and I'll compile a visitor compilation playlist. I can't guarantee I'll include all suggestions but I will do my best.